This was the first public performance by Shell Out Sounds. 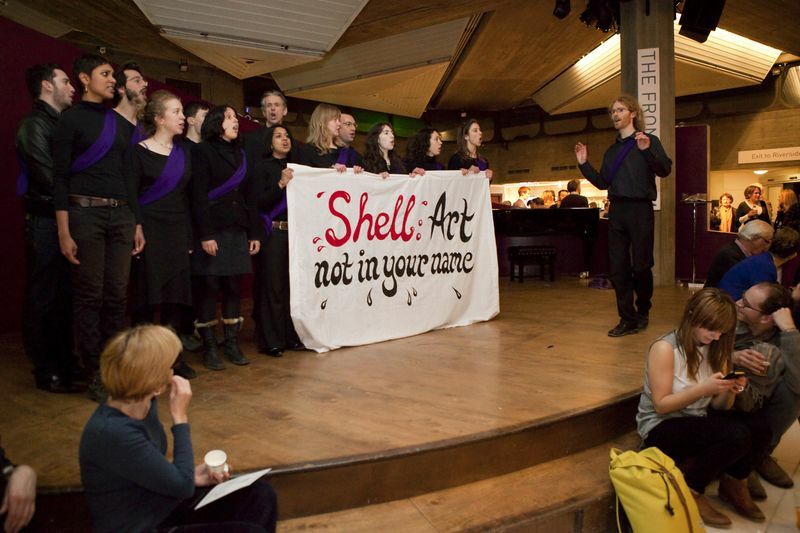 The new group brings together musicians and singers who are concerned about Shell sponsorship of the Southbank Centre. This is due to the oil giant’s significant contribution to climate change, its highly environmentally-destructive exploitation of the Canadian tar sands, its fracking operations around the world, its ongoing polluting activities in Nigeria and its controversial attempts to drill in the Arctic. The pop-up choir were all dressed in black with purple sashes, and sang from memory in three-part harmony. Each verse described the suffering of a community affected by Shell’s operations in Canada, Nigeria and Alaska, and concluded with the refrain “Oh, Shell, not your name; No more oil, no more pain; Oh, Shell not your name; Art not in your name!”.